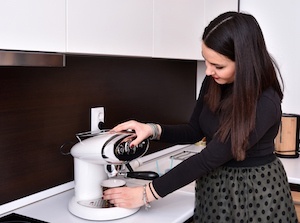 There's no special training needed to make an amazing cup of coffee or latte in your Springs luxury apartment home. Become your own favorite barista with this guide to preparing coffee that tastes like it came straight from an Italian cafe. It's a popular misconception that ground coffee has an indefinite shelf life. Coffee shops grind beans daily for a product that's fresh and full of flavor. With the wide range of coffee beans available, choosing one can seem a bit intimidating, but it won't take long to learn the lingo. Don't be afraid to go outside your comfort zone and try some different types. You may discover a new favorite! There's probably as much variety in coffee makers as there is in coffee beans. Narrow down the choices by deciding the primary purpose. Do you want to make specialty coffees? How about single-serve or multi-cup? Or are you just looking for a good cup of drip coffee? Once you've zeroed in on the style and features you want, it's easy to find consumer reviews and other information to help you make the final pick. Store beans in an airtight container on the kitchen counter. Keeping them in the freezer or refrigerator results in moisture buildup, which causes quality to deteriorate. Grind beans immediately before brewing. Use a scale instead of a measuring utensil for the optimum coffee-to-water ratio. Spring water or filtered water provide the best results. Avoid softened or distilled water. Place coffee in the filter and slowly pour a quarter-cup of hot water (heated to approximately 200 degrees) over them. Let the grounds sit for approximately 45 seconds before brewing. This pre-infusion releases any remaining carbon dioxide that could weaken the coffee. According to the Specialty Coffee Association of America, brewing water should be heated to approximately 200 degrees, the same as the pre-infusion water. Colder water doesn't extract enough flavor, while hotter water can cause a burnt taste. Wash all equipment after use to prevent oils from distorting the flavor of the next brew. Add-ins go beyond cream and sugar. After you've mastered a basic latte, branch out into specialty drinks such as the trendy pumpkin spice latte, Mexican coffee and even frappuccinos. Coffee isn't just for daylight hours. Why not whip up a batch of coffee cocktails the next time guests visit? Iced coffee, iced lattes and cold brew are refreshing summertime drinks. Delight family and friends with your own latte art. Do you consider yourself a coffee connoisseur? Share your best coffee-brewing tips and tricks in the comments!